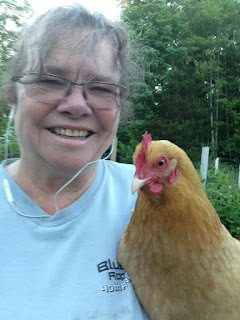 We raise beautiful Buff Orpington chickens, a dual purpose bird. The hens don't lay as many eggs per year as some other breeds, but they are gentle and quite large. When the hens stop laying at about three years old, we have them butchered, and I bone them out to make sausages. Use all the meat and skin, but you won't need too much of the fat. Mix the meat with the seasonings and grind with medium disk on your meat grinder. Add broth and mix well. Chill and grind again, using a smaller disk on the meat grinder. Stuff into casings or just freeze in 3/4 lb packages to use as patties or in other dishes. This was the best chicken sausage recipe I've ever made.